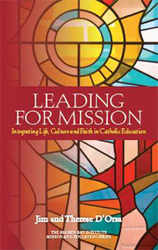 Leading for Mission: Integrating Life, Culture and Faith in Catholic Education is the third volume of the Mission and education Series. It is designed to provide leaders in today’s Church with the capacity to confidently match the strategic and operational elements of their leadership with a deep and contemporary commitment to mission. At a time when government funding policies are causing Catholic education systems and school leaders to focus on the future economic prospects for Catholic schooling across Australia, Jim and Therese D’Orsa have written a book that represents the canary in the coal mine. In what they refer to as this liminal era, Catholic schooling faces new and serious risks to the integrity of its mission. This is a challenge that must engage all leaders in Catholic education if our schools are to be places where Jesus’ message of the Kingdom is a lived reality, not a history lesson. What is required is leaders who are skilled not only in strategic and operational leadership but also in mission leadership: which is the focus of this outstanding book. Mission leadership utilizes theological reflection to enhance mission thinking which assists Catholic school leaders to respond to the multi-dimensional challenges of secularisation. The book is both sophisticated and practical, which has great appeal for Catholic school and system leaders who are seeking imaginative and thought-provoking ways to develop a sure-footedness in their leadership in these uncertain times. This is certainly a book for the times and all those who treasure the mission that engages the hearts and minds of Catholic educators/leaders in our efforts to create the Kingdom spaces which transform death-dealing post-modern culture into life-giving God-giftedness.